We were away from home for a couple of days last week when we went down to Yorkshire to attend the funeral of one of my best, and closest, friends, who I have known for more than forty years. It was only two months ago since we made exactly the same journey for the funeral of my sister, and nine months before that for my brother’s, so its been a very sad twelve months. As we crossed the snowy North Pennines I knew my friend would not have been best pleased that we were travelling in wintry conditions and that she would have told us to stay at home and not be so daft, but there was no way that was going to happen and, despite the sadness and the tears, I’m pleased that we were able to go and say our goodbyes to her. Our absence from home just happened to coincide with an overnight fall of snow followed by two very sunny and very cold days so we weren’t around to take a walk on the snowy Lakeland fells, but we could see the snow covered Peak District to the west of us on the day of the funeral, and I thought of how my friend would have enjoyed looking across at that view. 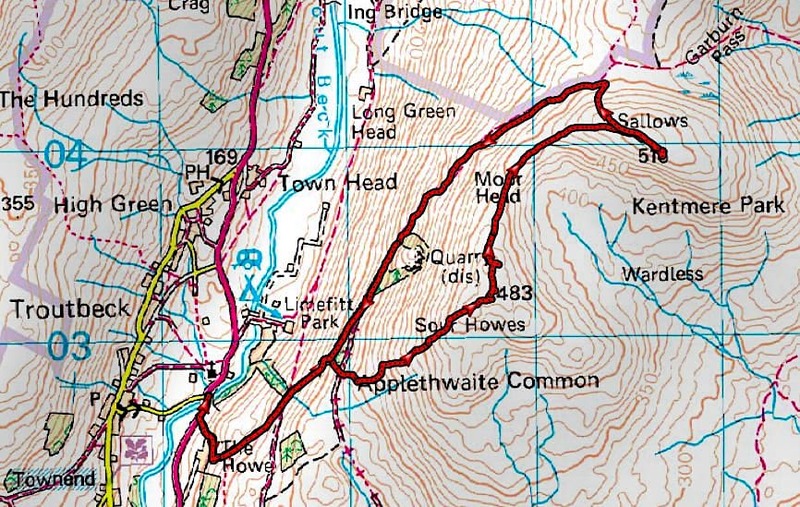 Since we came home the weather has not been quite so good, but there was a chance that it would be a little better today so we planned a short walk up to Sour Howes and Sallows just in case the weather turned against us later on in the day. 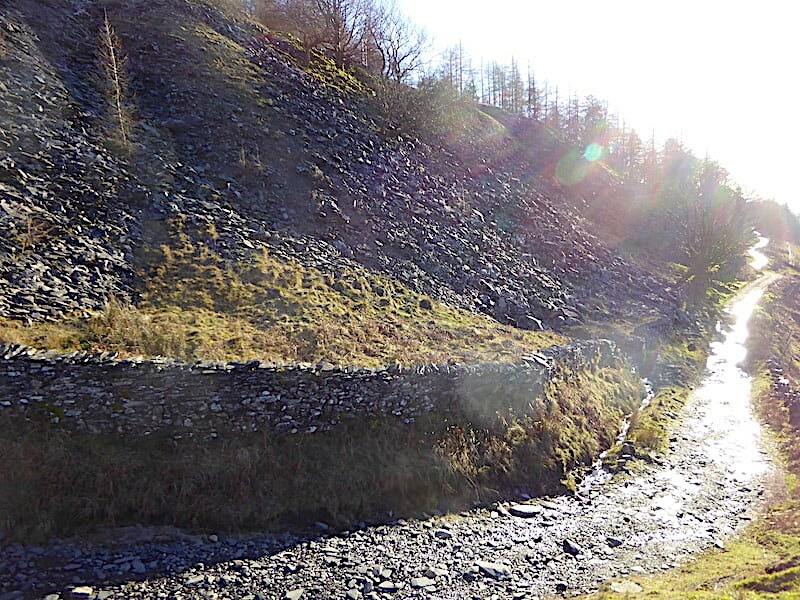 Troutbeck – Garburn Road – Applethwaite Common – Sour Howes – Moor Head – Sallows – Garburn Road – Troutbeck. We weren’t late leaving home but most of the minor roads we used were very icy so our journey took rather longer than it normally does and by the time we reached Troutbeck the little parking area beside the beck, out of shot to the left of the picture, was full. There was just one car space left at the pull in by the bus stop so we parked there, leaving enough room for the buses to still get into it. By the time we had sorted ourselves out and were ready for the off it was 10.30 am, but we weren’t in any rush, our planned walk was a relatively short one and the weather, although very cold, was brilliantly sunny with no sign of any clouds bearing rain or snow. 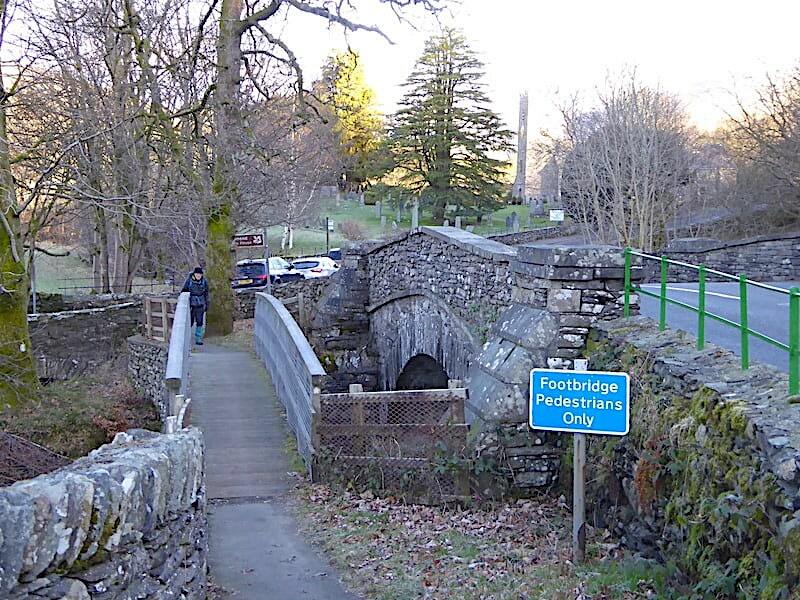 Here I take a look back towards the bus stop and Troutbeck Church as we cross Church Bridge. A little further along from the bridge we cross the road and begin making our way up the Garburn Road. 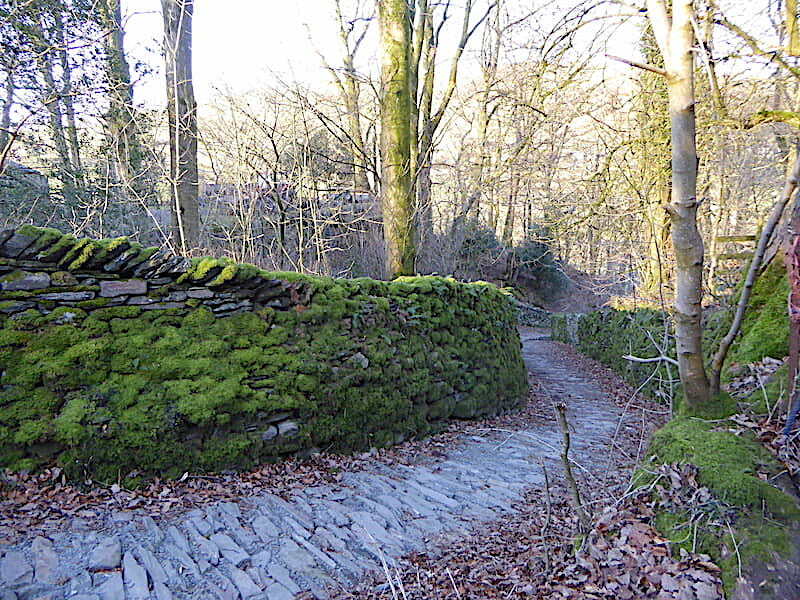 Its a stiffish climb and rather rough to begin with but eventually a laid path materialises which makes things a little easier. 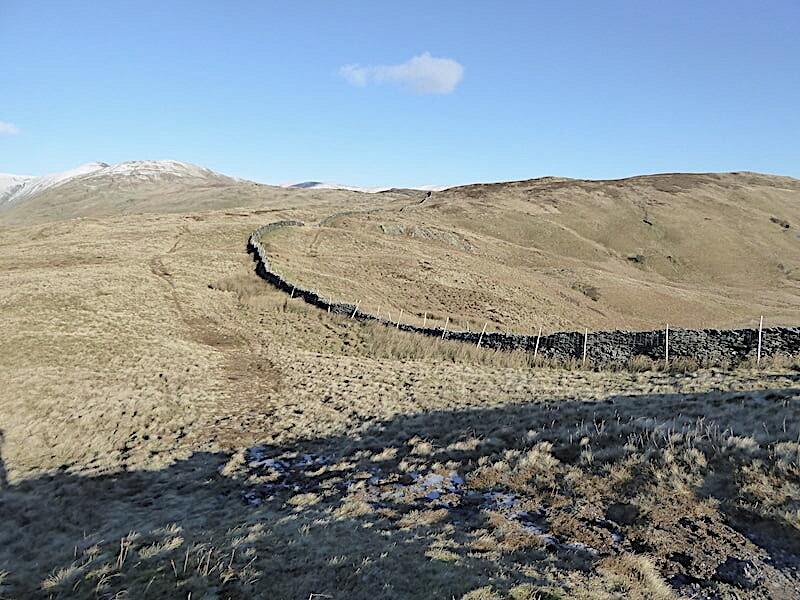 I took this look back at the point where the road bends slightly just below The Howe. Beyond The Howe the road makes a sharp left turn and continues climbing steeply before the gradient, and the heavy breathing, eventually eases. 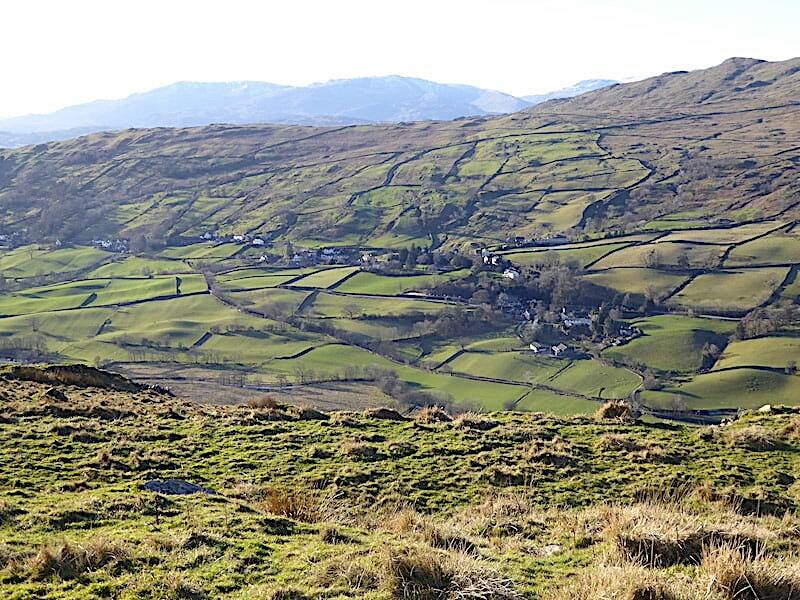 From the easier gradient the views across the valley begin to appear, here I’m looking across to the village of Troutbeck on the lower slopes of Wansfell. We’re in deep shade so hats and gloves are still required. 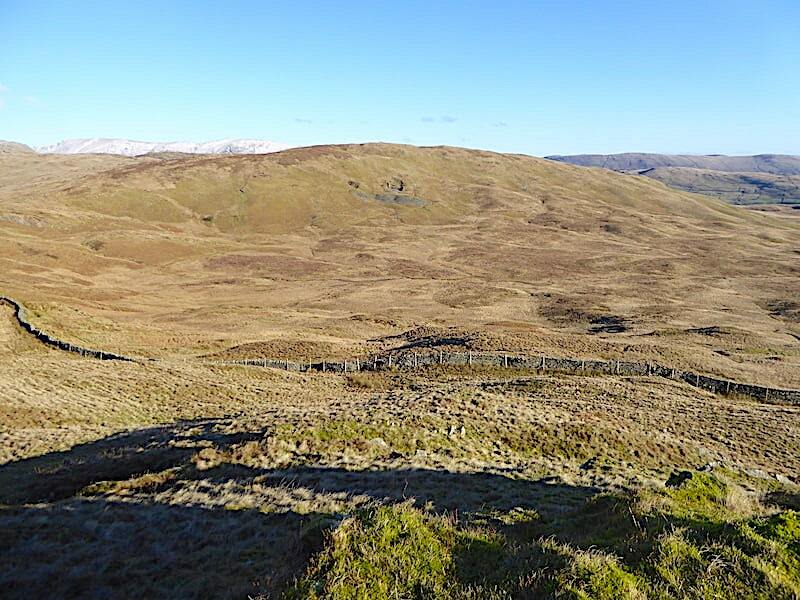 Looking ahead we can see the line of rock outcrops, known as Backstone Barrow, on the slopes of Sour Howes although the actual summit is not in view. 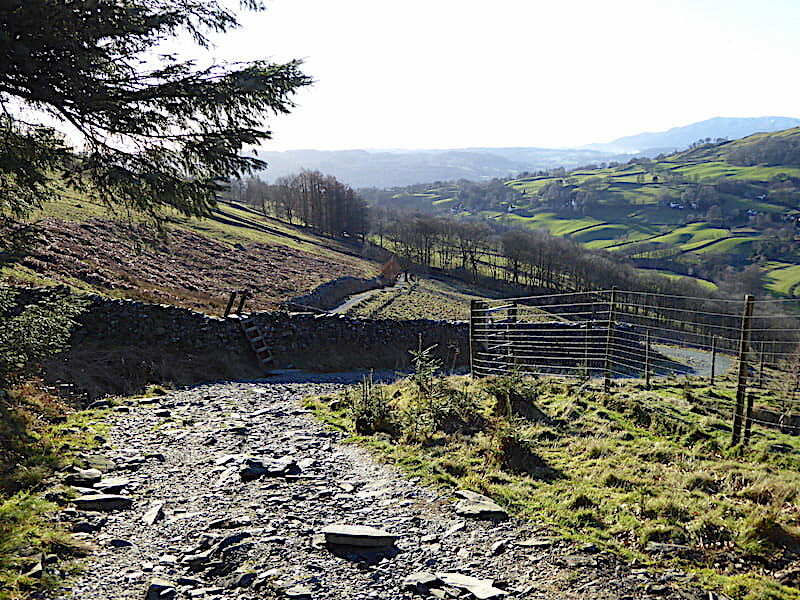 To the left of the track the view has opened up considerably and the lovely Troutbeck Valley appears. 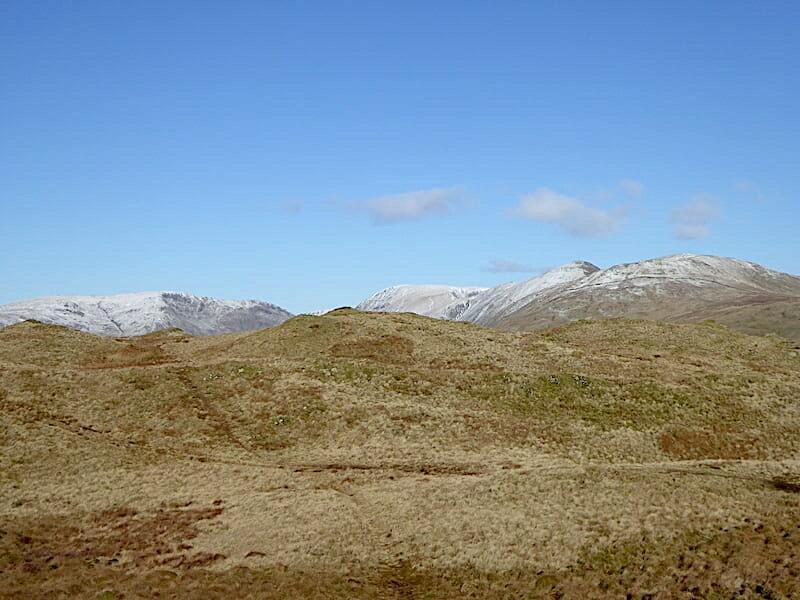 The small hill in the valley bottom is Troutbeck Tongue and on the skyline around it are Caudale Moor, on the left, with Thornthwaite Crag, Froswick, Ill Bell and Yoke to the right. All of them have only a dusting of snow so they look a little sparse, but the UFO like lenticular clouds above them were fascinating to watch. 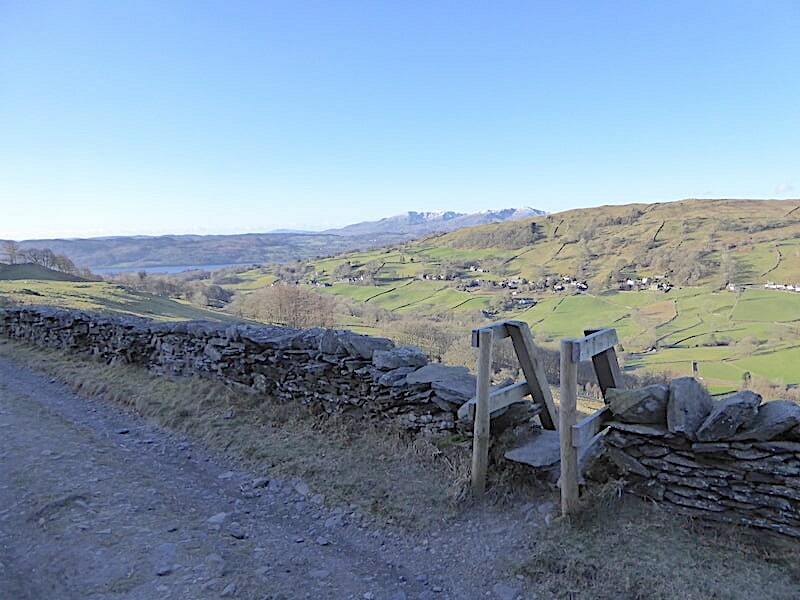 We left the Garburn Road, via this stile at the edge of a small plantation, and once we were over it I took a look back at the village of Troutbeck and the knobbly ridge of Wansfell on the skyline above it. 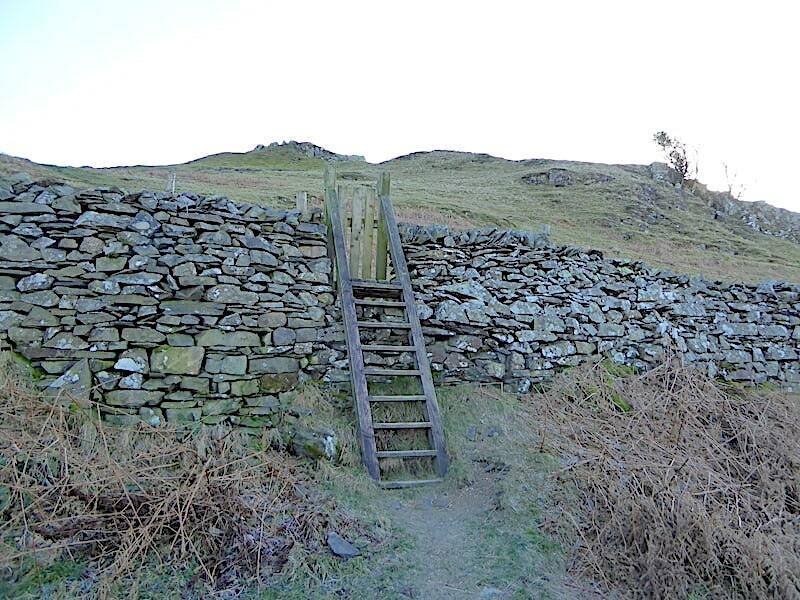 From the stile there’s a steep climb across a field to …..
….. to another gated stile over the top wall of the field. 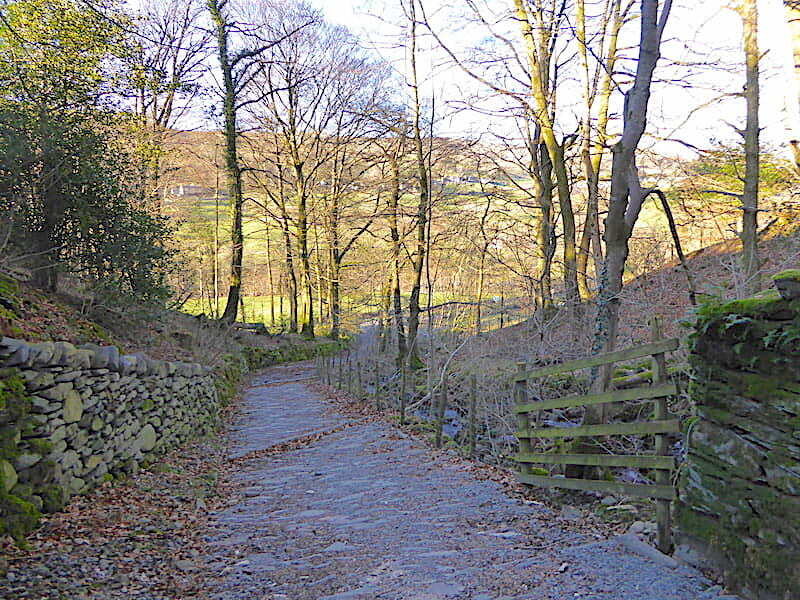 Having climbed up the stile you find yourself standing on the Dubbs Road, so named I suppose because it leads down to Dubbs Reservoir. 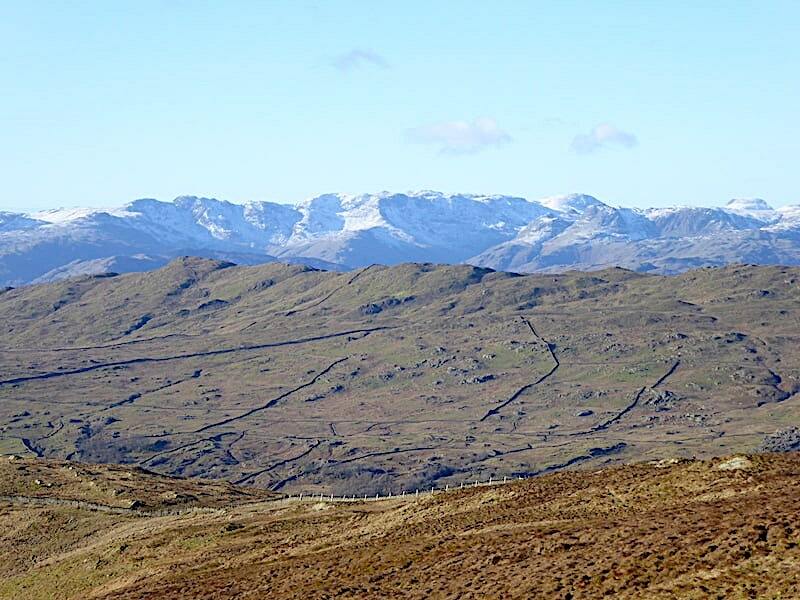 A smidge of Windermere has come into view and the Coniston Fells begin to appear over the lower slopes of Wansfell. 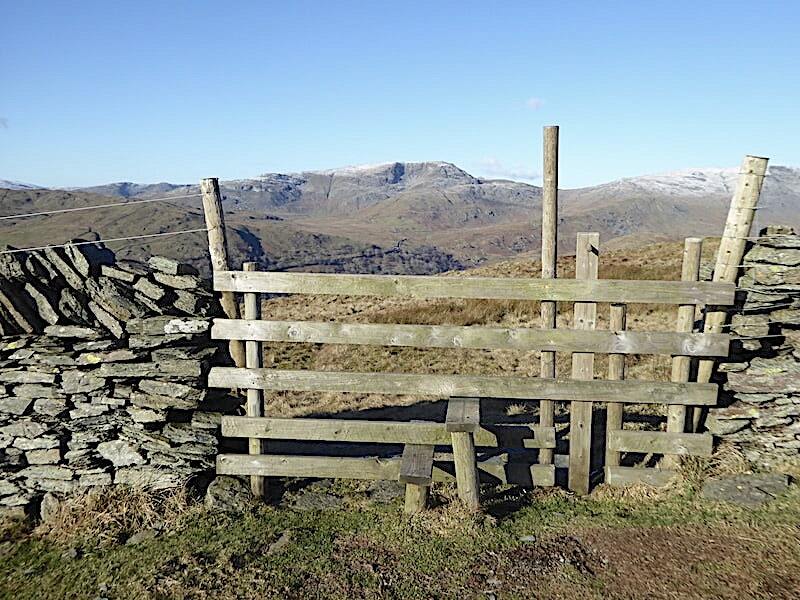 The stile climbing isn’t over and done with though because immediately opposite this stile is another gated one …..
….. which plonks you straight onto the fellside where the steep climb continues. Paths aplenty ahead of you so its just a matter of picking your preferred line and keep climbing. We’re back in the shade again after a couple of sunny stretches up to this point while Troutbeck and Wansfell remain bathed in sunshine. Back in the sunshine again and we reach the first rock outcrop on Backstone Barrow where the distant views are beginning to appear. 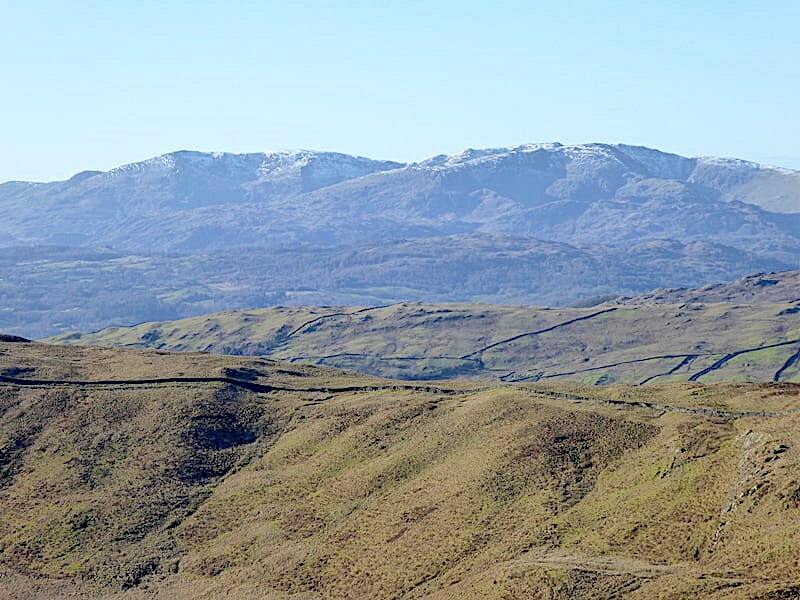 To the left of it are the Coniston Fells with the slightly snowier tops of the Southern fells to the right. 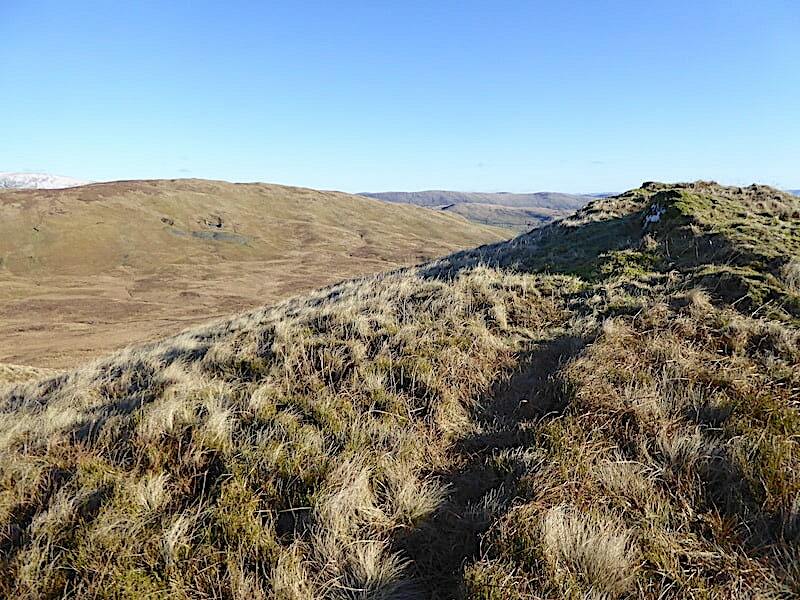 Still climbing the steep slopes with a look over to our left for a view of the head of the Troutbeck valley where Red Screes, on the extreme left, has now appeared. 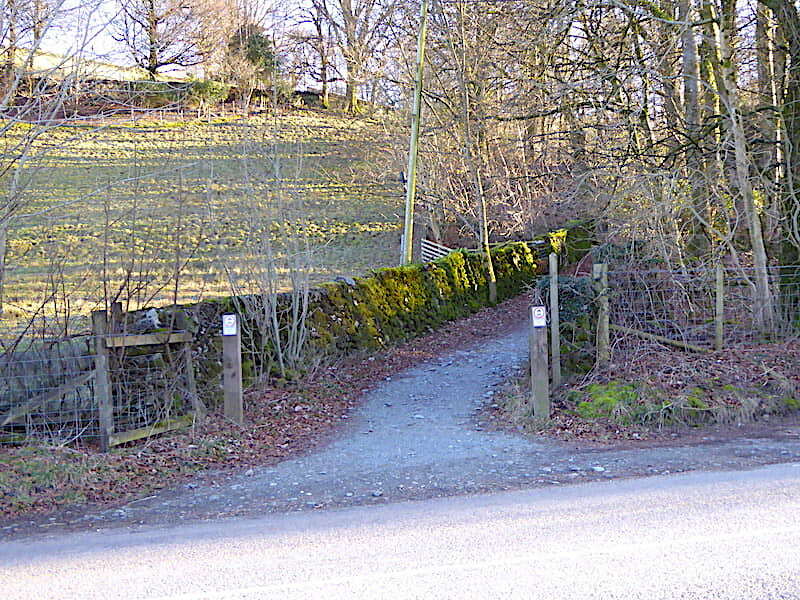 The Dubbs Road can be seen just above the tree line below us and a little further along it will eventually join the Garburn Road. 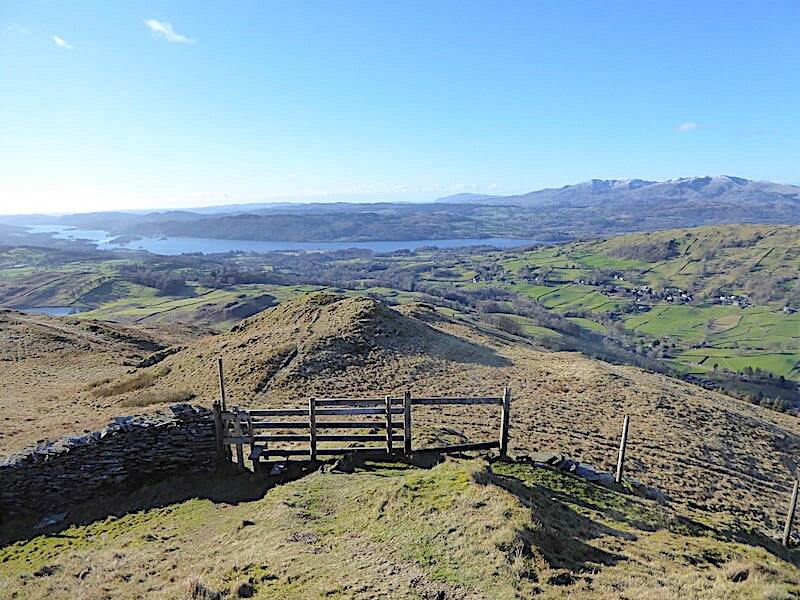 More of Windermere comes into view as we continue upwards. The path generally skirts around the outcrops but they aren’t very high and offer some entertaining little scrambles if the fancy takes you. 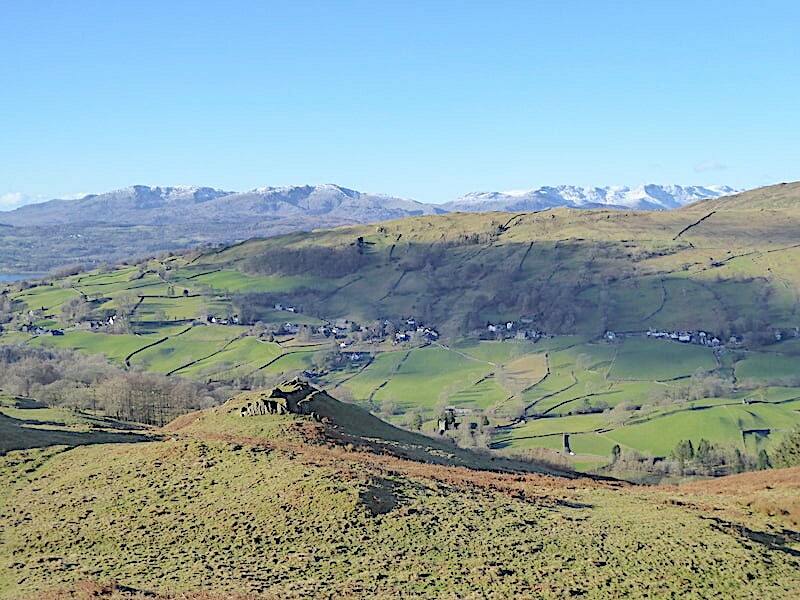 A zoom in back to the first rock outcrop with Troutbeck across the valley and some of the ‘big ‘uns’ on the skyline. Sour Howes isn’t a very high fell, standing at only 1585’/483m above sea level, but it still manages to pack a powerful punch with stretches of steep climbing coming one after another. In full winter gear with the sun directly on us its hot work so jacket and fleece zips get pulled open as far as possible to get rid of some of the heat. 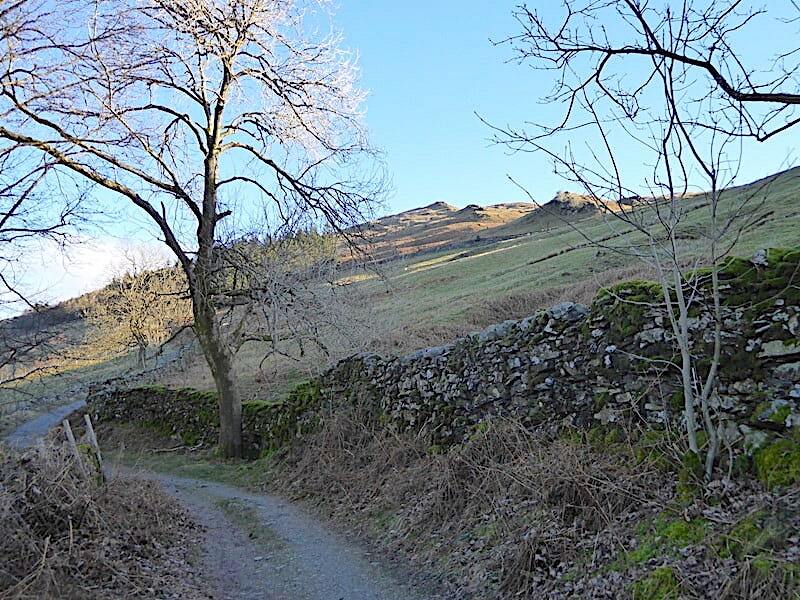 Above the last of the outcrops there’s a stile to negotiate and once across it I stopped for a look back. 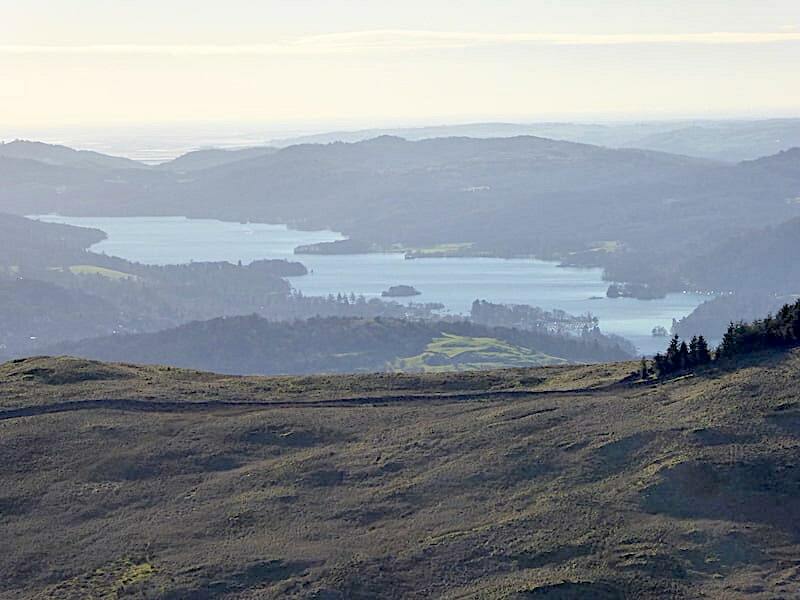 The lower reaches of Windermere have come into view and the small body of water on the left, just below Windermere, is Dubbs Reservoir. 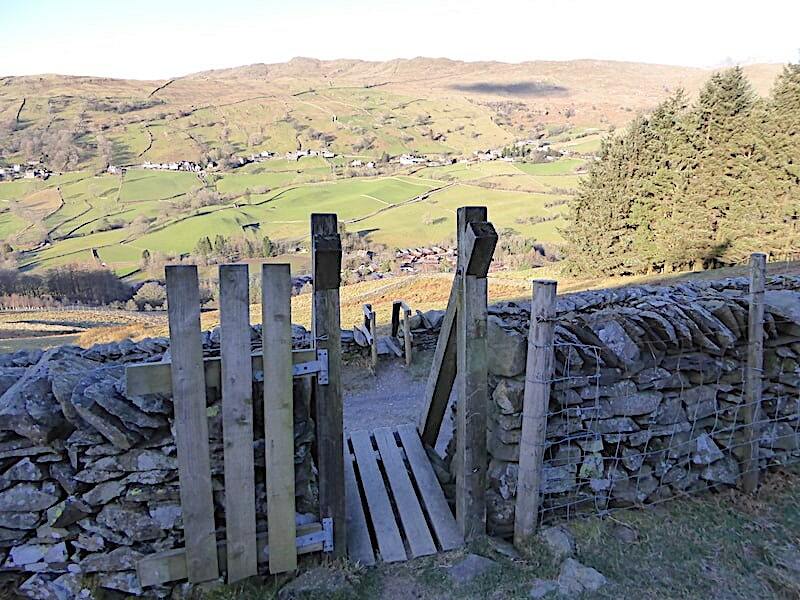 Beyond the stile and a view of the, not very snowy, skyline around the head of the Troutbeck valley. The lenticular clouds have given way to just a few oddments of fluffy cloud dotted around here and there. Beyond the stile we enter the maze of paths winding over and around a series of grassy knolls in search of the summit which is over towards the right of the shot. 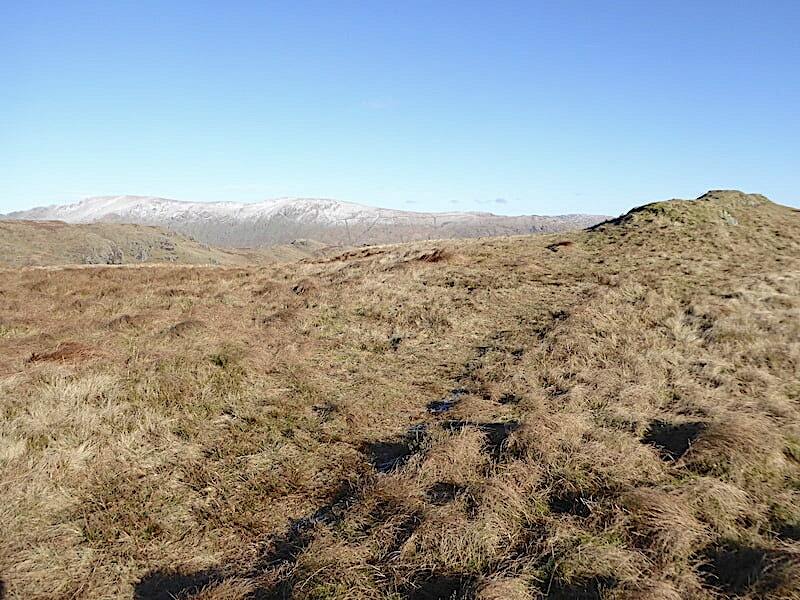 Looking across the plethora of grassy knolls on the summit area towards the Troutbeck valley skyline. The view across to Sallows which will be our next port of call. 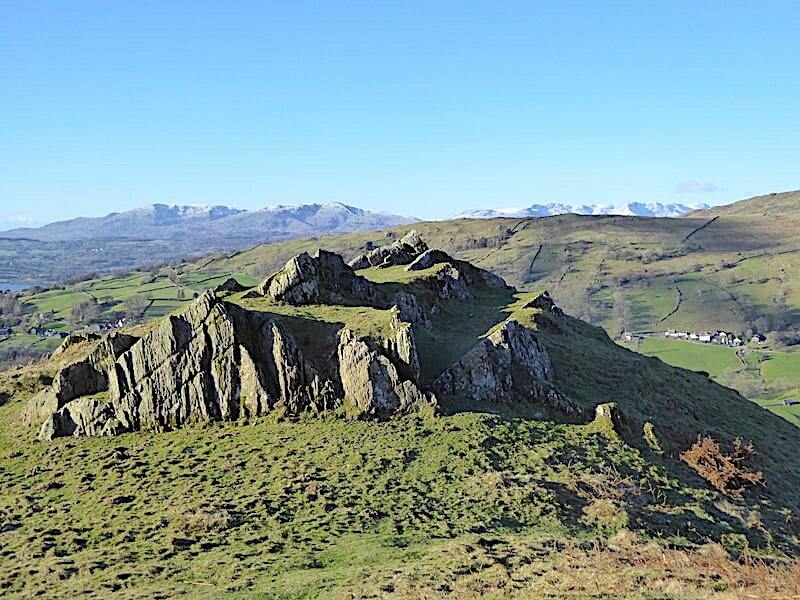 AW described the summit of Sour Howes as being ‘in the form of a ridge with walls of exposed shaly rock’, however …..
….. after wandering around checking the gps on a few of the knolls we found this one, for which the gps gave a reading of 485 metres, a whopping 2 metres higher, unless our gps is telling big fibs! 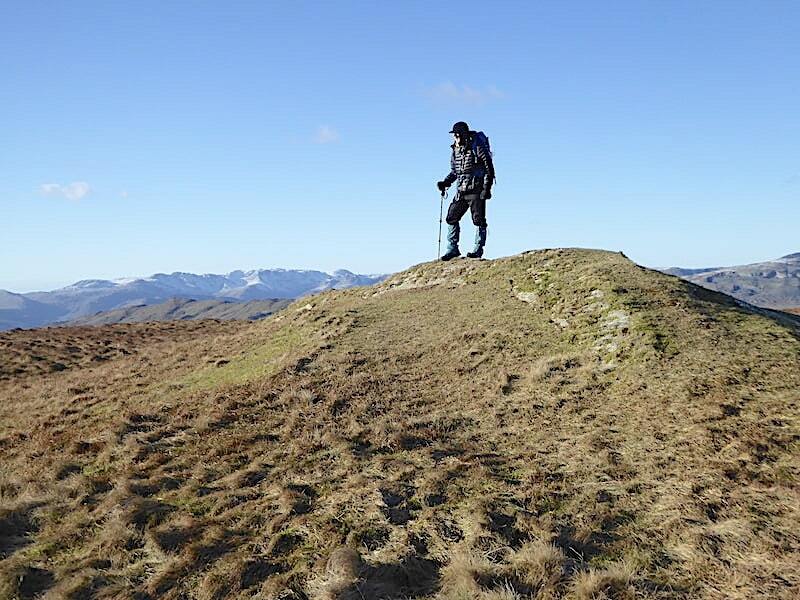 If you are a stickler for AW’s summits then its back over to the right of this shot, if you want to stand on a higher point then this could well be the one you want. You pays your money and takes your pick. 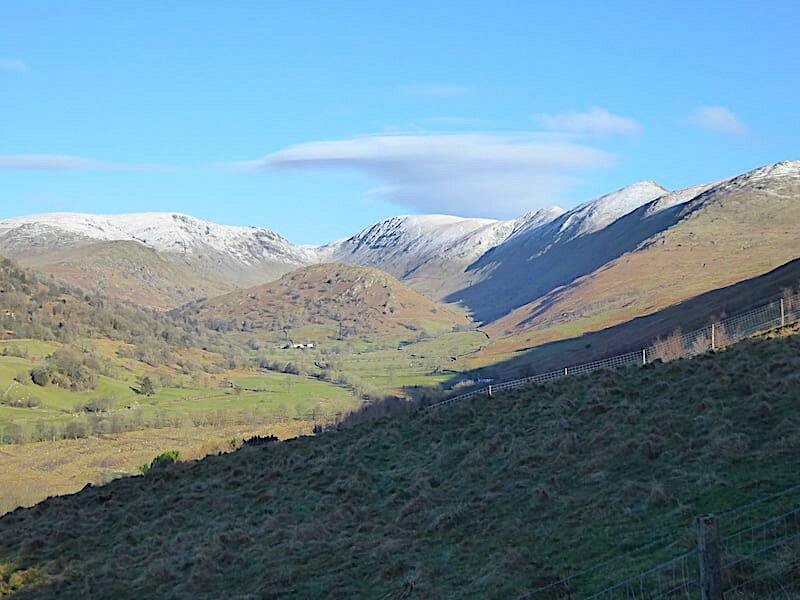 Whichever knoll you end up on the views are pretty much the same and here I’m looking across Kentmere Park towards the Howgills and the north Pennines. 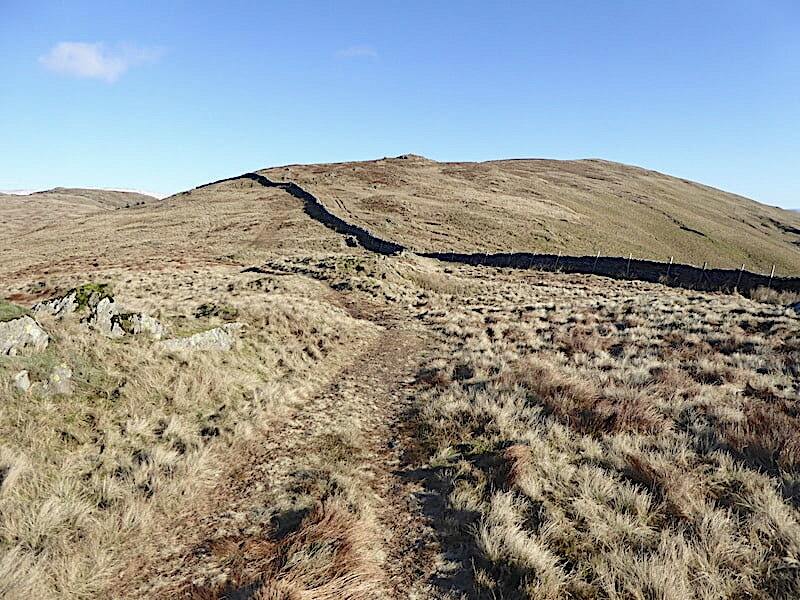 The wall below us is more or less the route we will take when we descend Sour Howes and make our way across to Sallows. Sallows from Sour Howes. 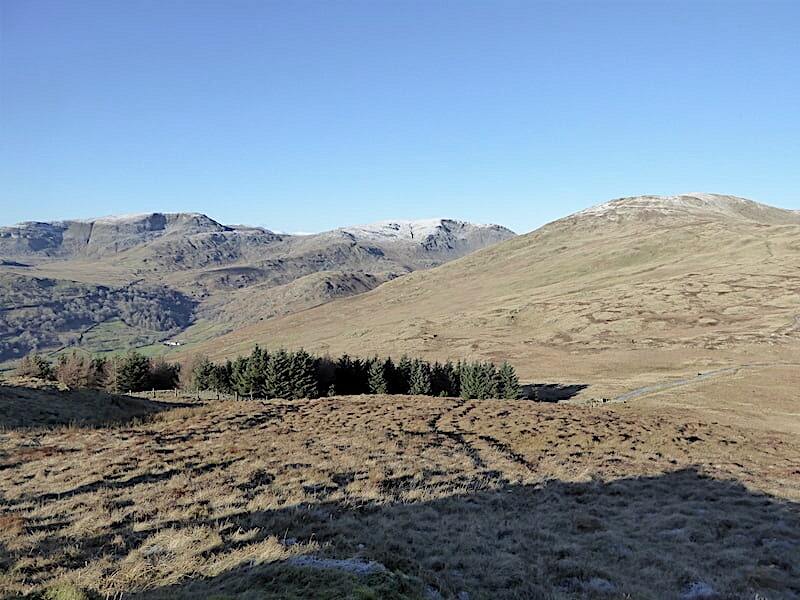 We were feeling the chill of the cold northerly breeze up here so we dropped down a short distance and found a sunny and sheltered spot in which to have a short lunch break. A solo walker passed above us as we did so but I don’t think he noticed us at all. He was only the third person we had seen since leaving Church Bridge, the other two being a solo male walker reaching the end of the Garburn Road as we were entering it, and a little further up it a dog-walking lady also making her way back towards the main road. Off we go after our lunch break for the short stroll across to Sallows, I think it took us just a little less than half an hour. 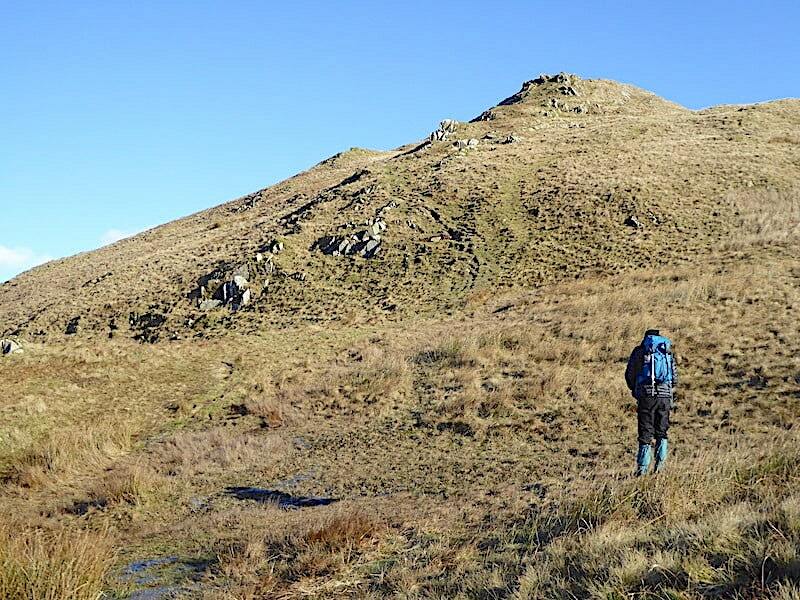 We were helped no doubt by the rock solid firmness of the ground and all the usual soggy, squelchy sections along the route were frozen solid so there were no wide detours to be taken around them. Every little helps, as the saying goes. Crossing the gentler gradients of Moor Head, with only 250′ of ascent between Sour Howes and Sallows there’s nothing steep to slow you down across here and so before very long …..
….. we reach the stile in the wall, which we cross, and from where I took a look across to Red Screes which was nicely framed by the wooden posts of the stile. 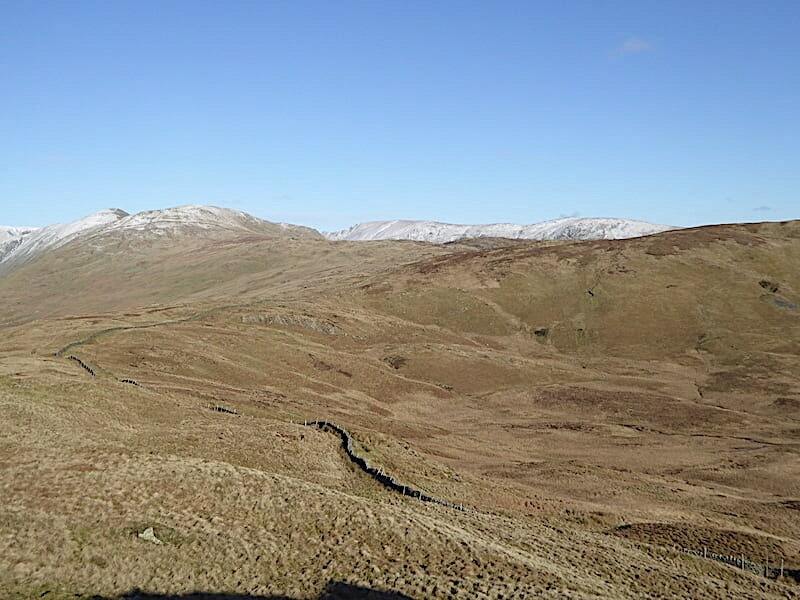 Another look back at Red Screes across the frozen terrain as we reach the flatter area towards the top of Sallows. 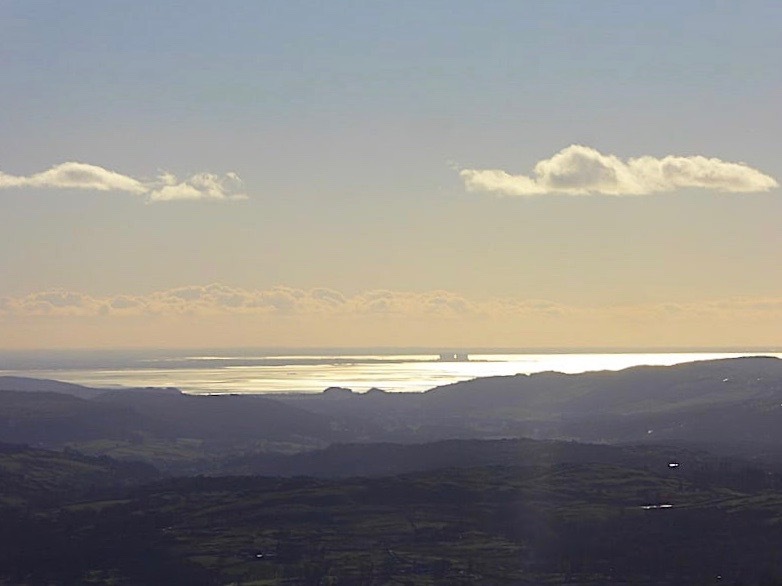 The Duddon estuary had a fantastic golden glow thanks to the brilliant sunshine, although I had to zoom in to cut out the sun to be able to capture it. 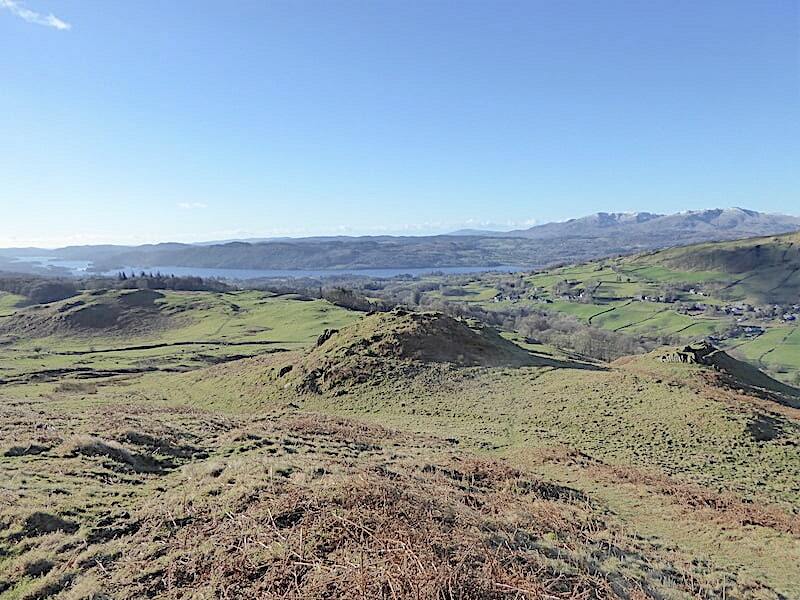 A closer look at Windermere. 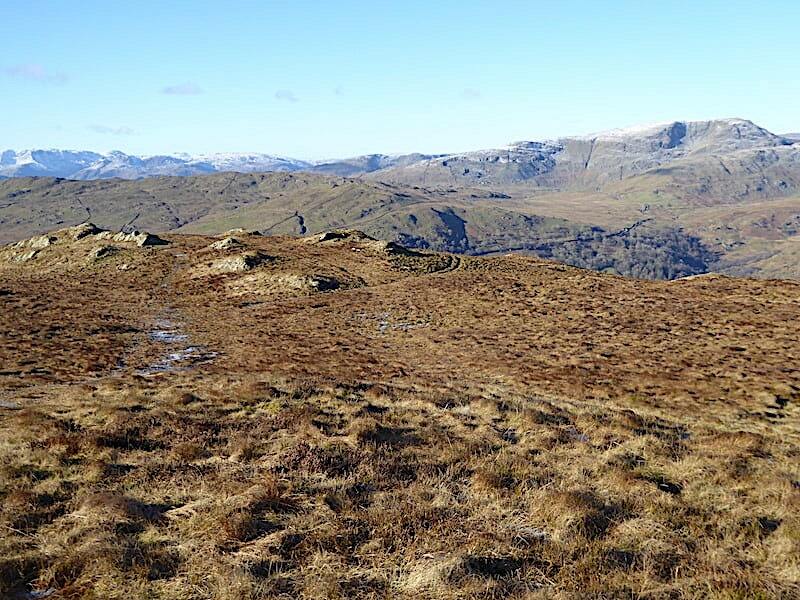 From Sallows a look across the upper reaches of Moor Head back to Sour Howes …..
….. and a zoom in across Wansfell to where Crinkle Crags, Scafell, Bowfell, Scafell Pike, Great End and Great Gable are adding a slightly alpine look to the skyline. 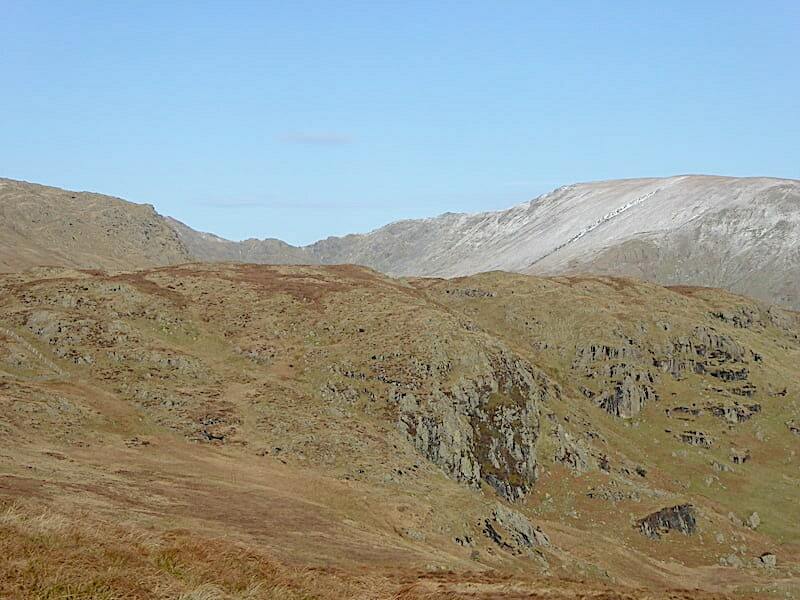 The Coniston fells however are looking a lot less alpine. 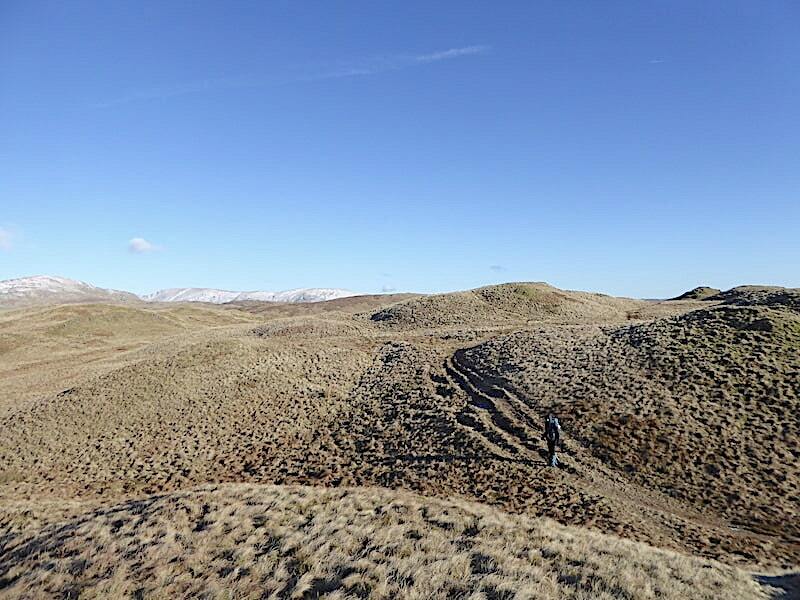 Sallows summit which AW described as ‘a curious curving mound of shale and grass’ and without a cairn. 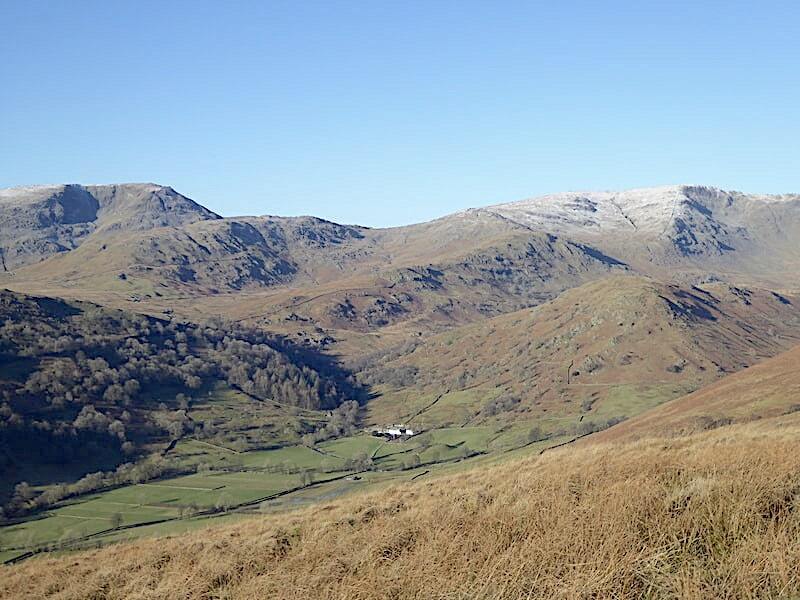 Harter Fell, Kentmere Pike and Shipman Knotts are on the skyline. 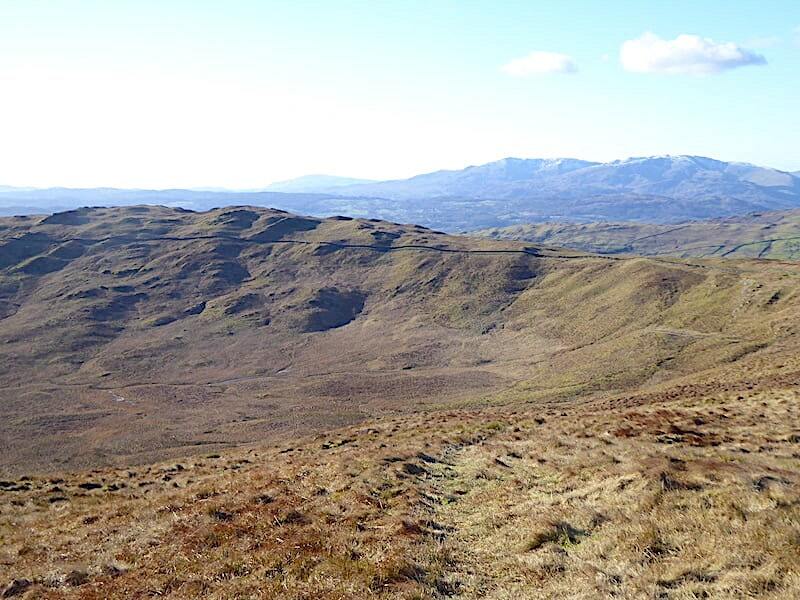 Looking northwards for a closer look at Yoke from Sallows summit. The wind coming at us from that direction wasn’t overly strong but it was cold enough to create watery eyes and noses every time we had to turn into it. 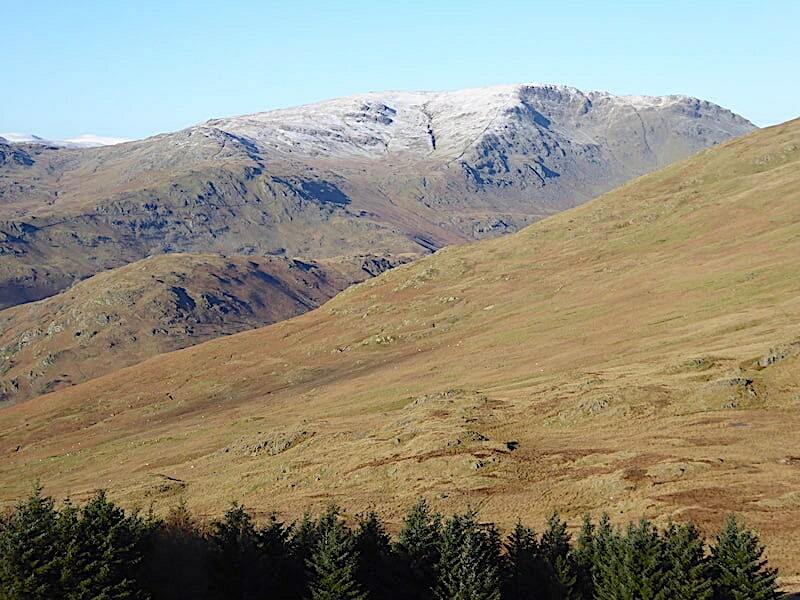 Harter Fell and Kentmere Pike on the skyline beyond the knobbly area of Crag Quarter above the Kentmere valley. 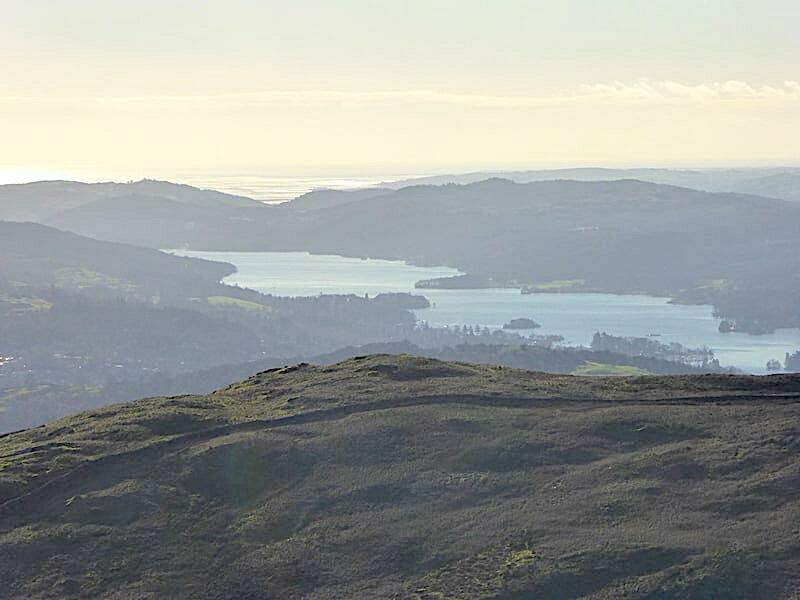 Another close up of Windermere below the slopes of Wansfell. 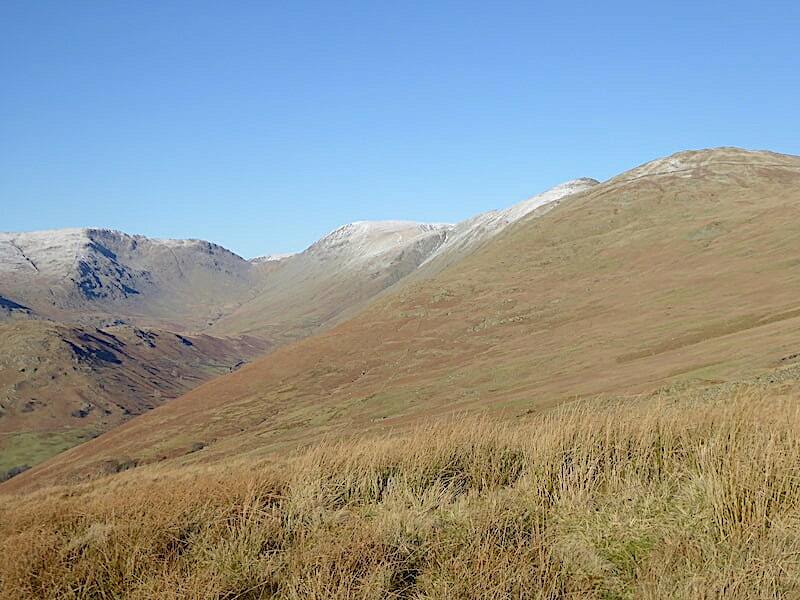 Looking towards Nan Bield Pass, the low point on the skyline. With a zoom in it might just be possible to pick out the shelter at the top of the pass, although at this distance it is only a very tiny dot. J gazes down to Windermere from the summit. Sallows isn’t all that much higher than Sour Howes standing at only 1693’/516 metres above sea level but even at that modest height it was pretty cold to be standing around for very long. We take our leave of Sallows and begin to descend back towards the Garburn Road to the right of the stand of trees below us. 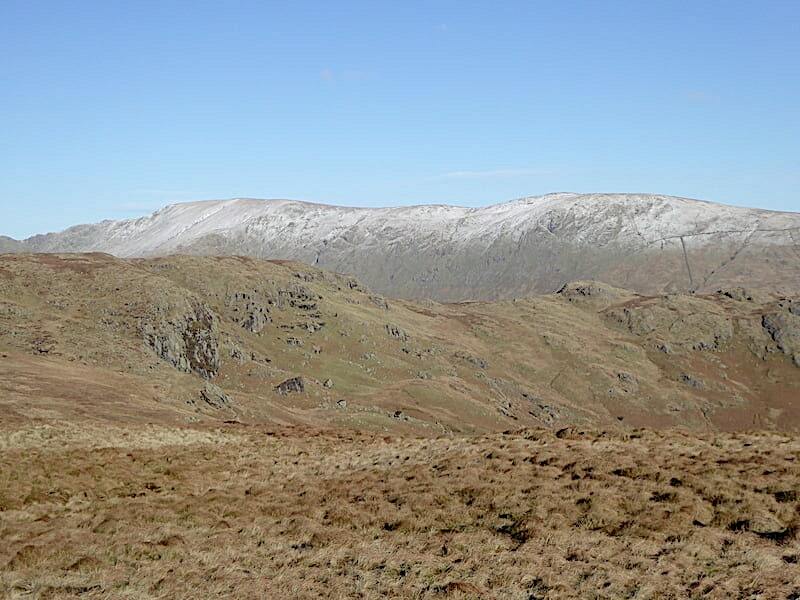 Red Screes on the skyline with St Raven’s Edge just below it. 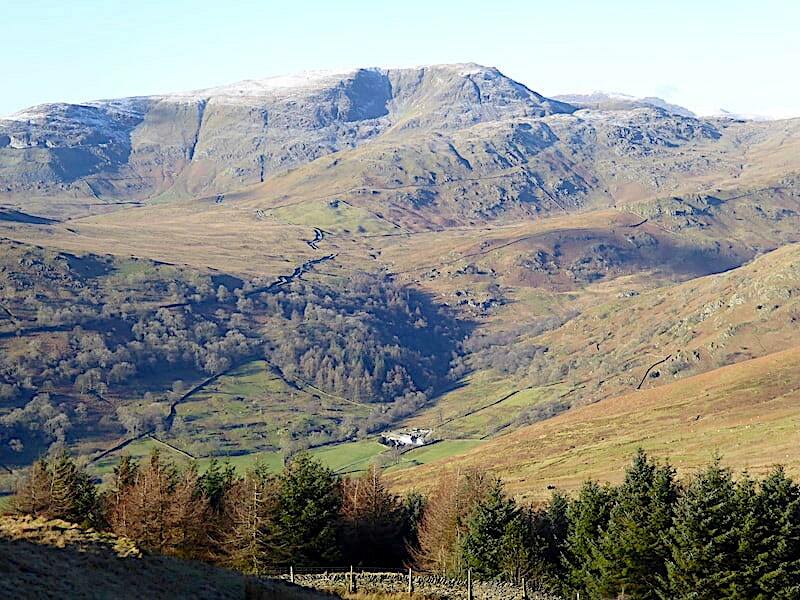 Nestling in the valley at the foot of Troutbeck Tongue is Troutbeck Park Farm, once owned by Beatrix Potter and one of the fifteen farms that she owned and bequeathed to the care of National Trust. 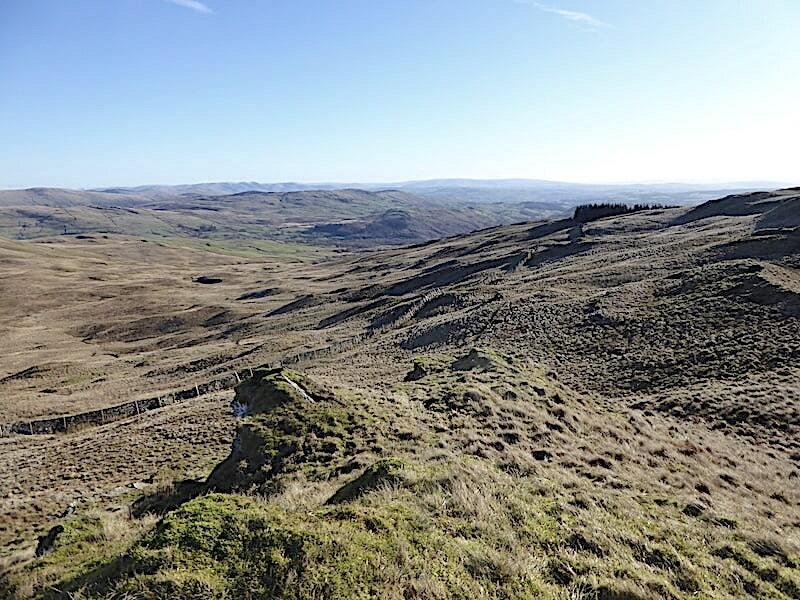 A closer look at Caudale Moor from our descent. 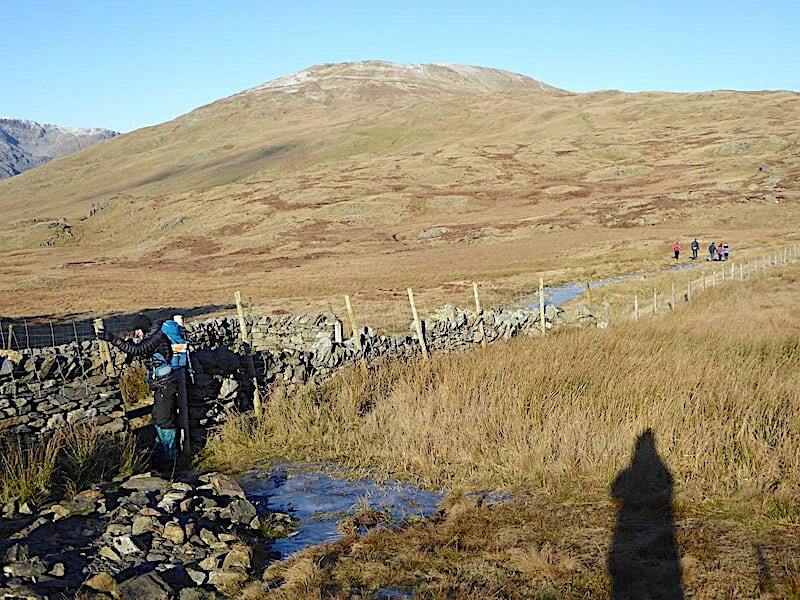 The usual watery mess at the stile was frozen solid today which was both a help and a hindrance. Nice not to get wet boots but a bit slippery to get a foothold on before climbing the stile. The group up ahead were youngsters, all of them looked, and sounded, quite young, and I did wonder if they were bunking off school/college for the day. If they were then I suppose its understandable on such a glorious day. 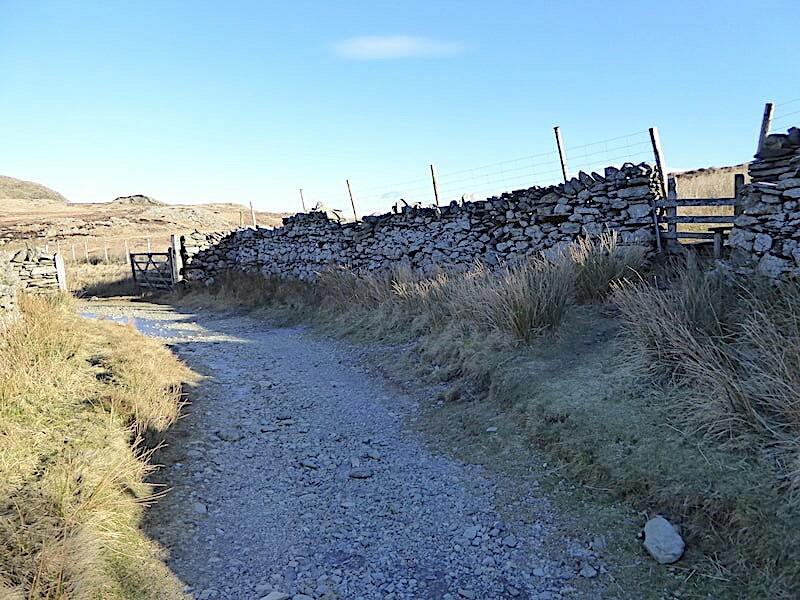 The stile we have just climbed over is on the right, the gate the youngsters have just passed through is on the left. 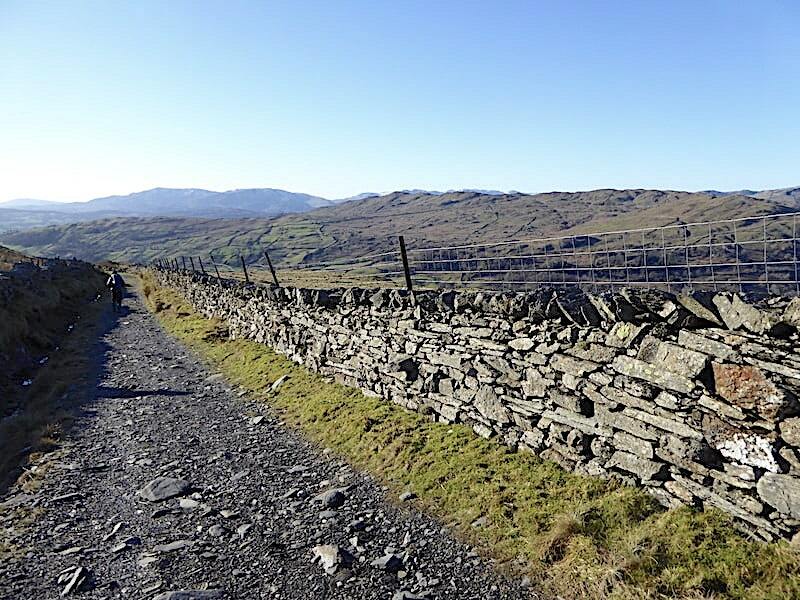 I turn around and we start off back down the Garburn Road …..
….. with the Coniston fells and Wansfell for company. We dropped out of the breeze and it became very warm in the early afternoon sunshine. I even took off my gloves, how about that for living on the edge. I would have taken my woolly hat off, but we all know what your hair looks like when you’ve been wearing a hat so I kept it on. I didn’t want to frighten any walkers who might have been coming our way. 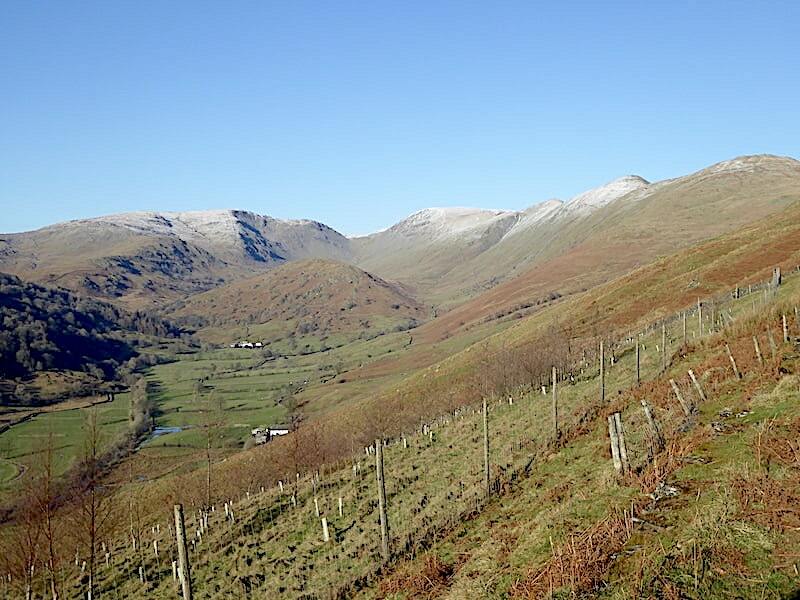 A look back at the fells at the head of the Troutbeck valley. They didn’t have much snow to begin with and there’s even less of it now the sun’s been on them for a few hours. 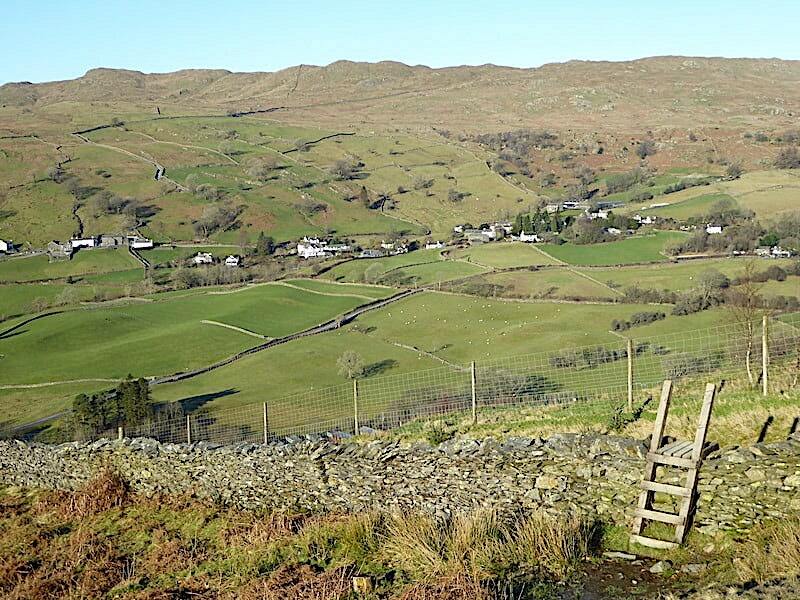 Another look across to Troutbeck Park Farm at the foot of Troutbeck Tongue. 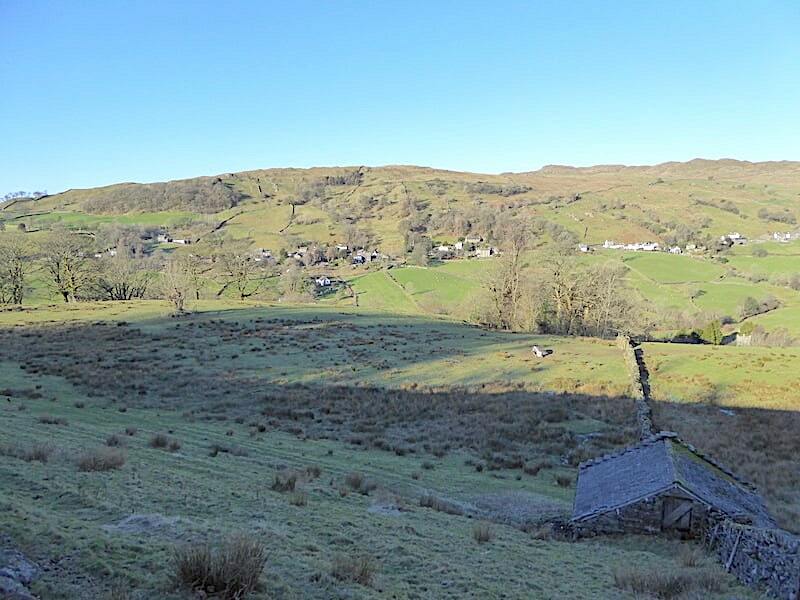 The gentle green fields below Troutbeck village were a lovely sight …..
….. although the lengthy stretch of sheet ice sparkling along the track wasn’t quite so enjoyable. We had our spikes with us but we hadn’t needed them so far and it was too fiddly to start putting them on now so we kept to the grassy edges instead. 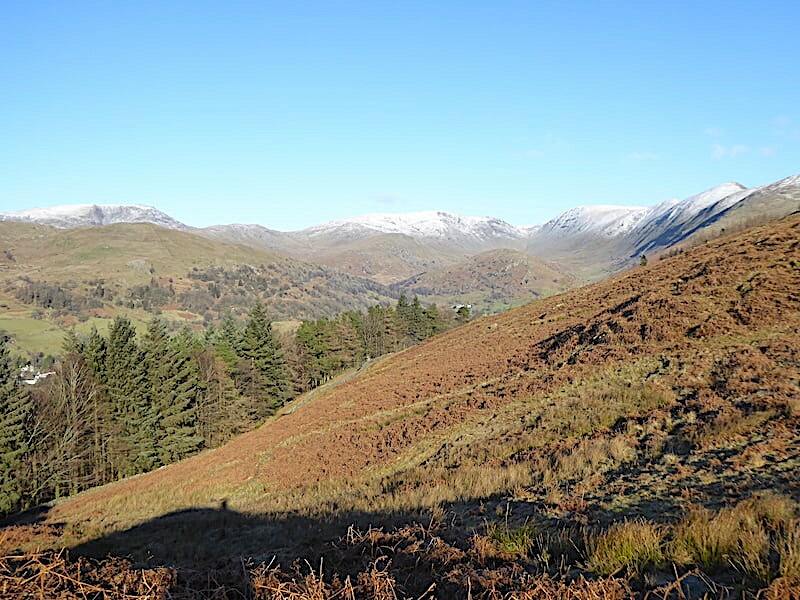 A final look back along the Troutbeck valley …..
….. and a look ahead as we reach the stile where we turned off up the field earlier in the walk. We’re almost at the end of the Garburn Road now and the traffic on the A592 is whizzing by just below us. Once across the busy road I took the shot I meant to take this morning which shows the start (or end) of the Garburn Road route we took earlier on. 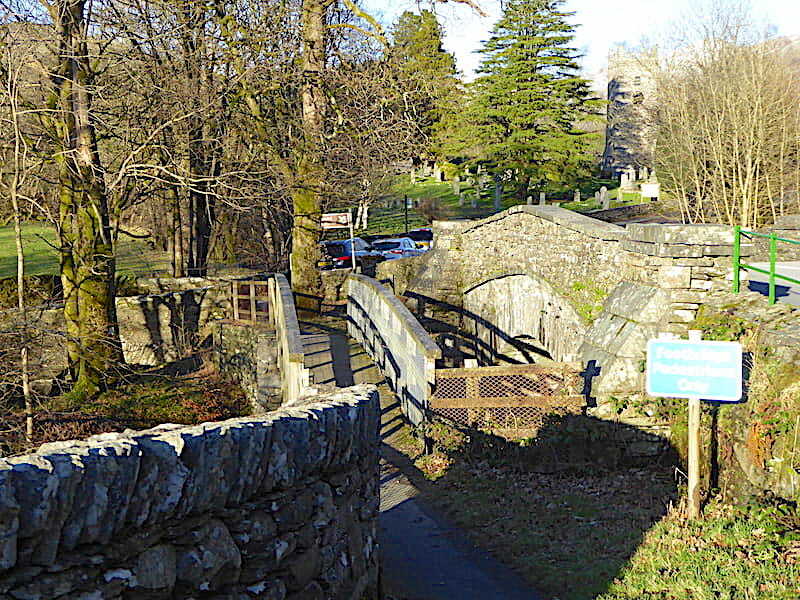 Back at Church Bridge in Troutbeck where our car and the two others, which were there when we arrived, are still awaiting the return of their owners, so that’s the end of today’s walk. 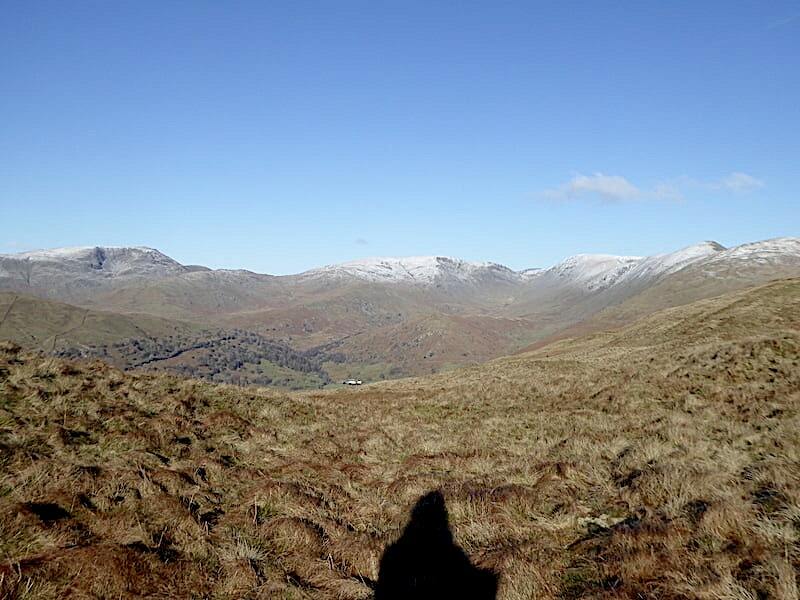 Its been good to get out on the fells again and enjoy this grand little walk. 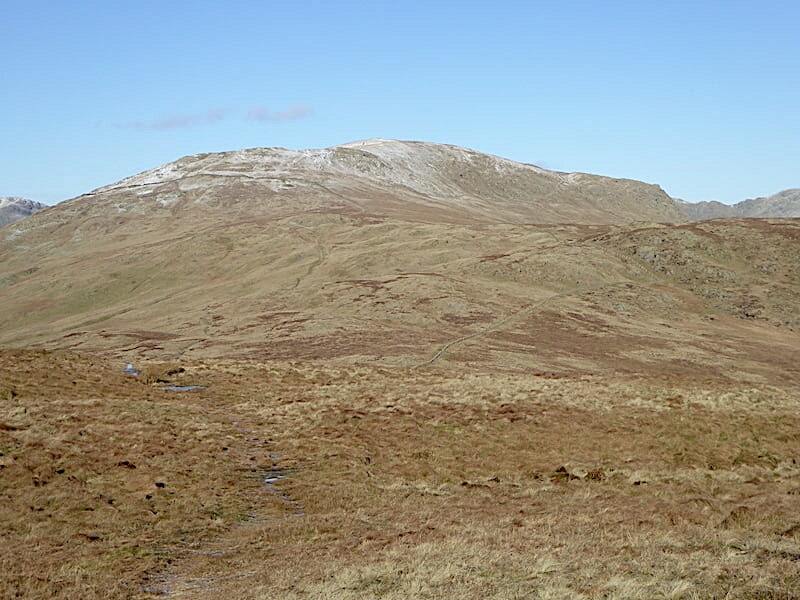 We haven’t been on these two fells since 2015 so they were due a return visit and today’s weather was just perfect to do that. Now its time to drive past the church, head up the hill and make for home in the hope that the sun has done its job and that the sheets of ice which were layering the minor roads this morning have all magically melted away.